In light of the Senior need in the community, Comfort Keepers is ready to give back to those in need. 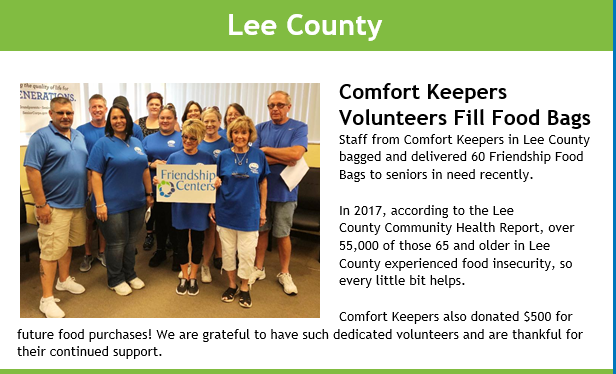 Comfort Keepers Fort Myers has volunteered with the Lee County Friendship Centers to fill and deliver 60 Friendship Food Bags for elders in need. In light of the Senior need in the community, Comfort Keepers is ready to give back to those in need. Senior hunger is very real. It impacts areas that most wouldn’t even realize. According to the Lee County Community Health Report, in 2017, over 55,000 of those 65 years and older in Lee County had experienced food insecurity. This means, 55,000 elders were unsure they would have access to a sufficient quantity of nutritious food. Elder nutrition is incredibly important to maintain strength, wellness, and ward off sickness. Malnutrition in seniors is a common problem that could be avoided with a healthy and nutritious diet. For those who have limited access and means to get nutritious food, this could seem nearly impossible. Dawn Pudlin, Comfort Keepers Fort Myers general manager, is constantly looking for ways to give back to the community through charitable acts. After partnering with Lee County Friendship Centers, Pudlin was alarmed with the high statistics of elders with food insecurity. Multiple staff members, including Pudlin, helped bag and deliver 60 Friendship Food Bags to seniors in need. Comfort Keepers Fort Myers also donated $500 to aid towards future food purchases. Teaming up with local charities and help centers in the Lee County area, and beyond, has allowed Comfort Keepers to continuously accomplish their goal of giving back. Comfort Keepers aims to “elevate the human spirit” by providing top-notch senior health care services. Comfort Keepers Fort Myers is a leading provider of senior care services for elderly adults and their families in Fort Myers, FL, and the surrounding areas. We are an in-home care services agency, and our team of caregivers and health aides is dedicated to ensuring that your senior loved one leads the best quality of life from the comforts of his or her own home. We offer in-home care, respite care, dementia and Alzheimer's care, and many more. Call us today at 239-590-8999 for information about the services we provide and with any questions you may have.